Spent Glory or Future Empire? Although the Scriptures focus upon God's dealings with His Chosen People, the Jews, the non Jews (known in the Bible as the Gentiles), are not ignored — as the quote above from Jesus demonstrates. The Bible teaches that God chose the Jewish people to serve as witnesses of His glory (Isaiah 41:10-12). He also chose them to serve as a channel of His blessings to the world (Genesis 12:1-3). Through the Jews, God revealed Himself and His Law. And through the Jewish prophets, He pointed Mankind to the coming Messiah (1 Peter 1:10-12). God did not start using the Gentiles as a vehicle of His purposes in history until His Chosen People turned their backs on Him and gave themselves to human idols. At that point in time, God began to work through both the Jews and the Gentiles to carry out His plan of redemption. His first step was to bring judgment upon the Jews for their idolatry. He did this by allowing them to be taken into exile by the Babylonians. It was during this exile (605 — 536 B.C.) that God revealed to His prophet Daniel that He had a plan for using the Gentile nations to help achieve His purposes in history. Daniel was one of the Jewish exiles. He came to the attention of the Babylonian leaders through his ability to interpret dreams. He was called upon to interpret a troubling dream which God gave to the Babylonian king, Nebuchadnezzar. The king saw a huge statue of a man in his dream. The statue was made of a succession of metals. It had a head of gold, a silver chest, thighs of brass, and legs of iron. It rested upon a precarious foundation — feet of iron mixed with clay. As Nebuchadnezzar stared at the statue, admiring its beauty, the feet were suddenly struck by a supernatural stone (“a stone cut out without hands”). The statue collapsed, and the stone expanded rapidly into a mountain that engulfed the whole world (Daniel 2:31-35). Daniel explained that the dream dealt with the future and extended even to the “latter days” (Daniel 2:28). He pointed out that the golden head was representative of the Babylonian empire. It would be succeeded by another empire represented by the silver chest, and it would, in turn, be overthrown by another empire symbolized by the thighs of bronze. The fourth empire in the series was represented by the legs of iron (Daniel 2:36-40). Later, God revealed to Daniel that the empire that would follow Babylon would be the Medo Persian which, in turn, would be overthrown by the Greeks under Alexander the Great (Daniel 8:1-8, 20-21). The empire symbolized by the iron legs was never specifically identified, but we know from history that it was the Roman Empire which eventually split into two parts, the Eastern and Western Empires. The prophecy evidently contains a time gap because there is nothing in history that corresponds to the empire represented by the feet of iron mixed with clay. In subsequent dreams and visions, the Lord revealed to Daniel that this kingdom of iron mixed with clay would be a loose confederation of ten nations (Daniel 7:24). This confederation would arise out of the territory of the empire of iron — the Roman Empire (Daniel 7:7-8). Daniel was also shown that this revived European confederation would serve as the base for the construction of the last great Gentile world empire — namely, the empire of the Antichrist (Daniel 7:8,24-26; 8:19-27). Further evidence of a time gap is found in the fact that history fails to show a ten nation European confederation expanding into a world empire and then being suddenly destroyed by a supernatural intervention of God. Nor has a kingdom from God encompassed the whole world, submitting the nations to the rule of the Messiah (Daniel 2:41-45; 7:13-14,27). Fortyeight years after Nebuchadnezzar’s dream, the Lord gave Daniel a vision of the same succession of Gentile empires. However, instead of a glorious statue of a man, Daniel saw a series of ravenous wild beasts which devoured each other. The first beast, representing Babylon, was a lion that had wings like an eagle. The second, a symbol of Medo Persia, was a bear raised up on one side. Next came a leopard with wings like a bird, representing the rapid conquest of Alexander the Great who built the Greek Empire. The fourth beast was “dreadful and terrifying and extremely strong; and it had large iron teeth” (Daniel 7:7). It also had ten horns (Daniel 7:7). The iron teeth of the beast relate to the iron legs of Nebuchadnezzar’s statue, and so it represents the Roman Empire. While Daniel was observing the fourth beast, “a little horn” representing the Antichrist grew out of the beast’s head. It subdued three of the other horns and then took over the rest of the horns. It then quickly “devoured the whole earth” (Daniel 7:23-25). But after three and one half years, it was judged and “destroyed forever” (Daniel 7:26). It is obvious that the feet and ten toes of Nebuchadnezzar’s statue correspond to the ten horns of Daniel’s vision. Both represent a coalition of ten kingdoms which will serve as the base from which the Antichrist will conquer the world. Why two presentations of the same succession of empires? Nebuchadnezzar’s dream presents the prophecy from Man’s viewpoint, looking upon the empires as beautiful and glorious. Daniel’s vision sees the kingdoms from God’s viewpoint — as a succession of wild beasts who are cruel and ruthless. In both cases, the final Gentile empire of the Antichrist is suddenly destroyed supernaturally, bringing to an end what Jesus referred to as “the times of the Gentiles” (Luke 21:24). The “times of the Gentiles” began with Nebuchadnezzar. They continue to this day, and they will not end until the Second Coming of Jesus. The ruthless glory of the Gentile empires was temporarily suspended when the Roman Empire split and then later collapsed. At that point the international community reorganized into nation states. Since that time there have been many attempts to rebuild a great Gentile world empire, the three most notable being the Holy Roman Empire (the First Reich), the French Empire of Napoleon, and the Third Reich of Hitler. However, all of these fell short. But the glory is not all past. The greatest Gentile empire is still future. It will be the empire of the Antichrist. That's what all the talk about a “New World Order” is about. Satan is coalescing a new world wide Gentile empire. Its nucleus is being provided through the reunification of Europe. Before long, some dynamic, charismatic political personality will emerge in Europe who seems to have the answers to all the world's problems. Europe will unite behind him, and he will then venture forth to build a new world order, using both deception and force (Daniel 11:36-45 and Revelation 6:1-6). The final Gentile empire will unite the world politically, socially, economically and spiritually. Every nation will be included (Revelation 13:7). The Antichrist will be assisted by a False Prophet who will pull together the world's religions into an amalgamated, apostate super church that will worship the Antichrist (Revelation 13:11-18). At the end of seven years of unparalleled tribulation upon the earth, God will pour out His wrath upon this last Gentile empire. Its overwhelming destruction by fire will take place in one hour (Revelation 18). That's when Jesus will return to set up another new world order — the perfect world order. He will reign from Mt. Zion in Jerusalem with a rod of iron, and the world will be flooded with peace, righteousness and justice as the waters cover the seas (Isaiah 11:9 and Habakkuk 2:14). The “times of the Gentiles” are rapidly coming to a close. Jesus said the final days of this time period would be marked by the liberation of Jerusalem from Gentile control (Luke 21:24). That glorious event took place on June 7, 1967 when the Jews reconquered the city of Jerusalem for the first time in 1,897 years. The Orthodox Jews know the Old Testament prophecies, and those prophecies say that the Jews will be back in the land of Israel and the city of Jerusalem when the Messiah comes (Ezekiel 37 and Zechariah 12). Do not be deceived by all the talk about a “New World Order.” It is the old world order dressed up in new clothes. Satan is pulling together one last worldwide Gentile empire in his futile attempt to frustrate God's master plan. Most of the world will be deceived into believing that this “New World Order” will produce a utopia on earth. It will create, instead, a living hell. The “New World Order” is doomed to failure, for it will be based on the wisdom of Man. Pray for the coming of the perfect world order that Jesus will establish when He returns. It will be based upon the Word of God. Dr. David R. Reagan serves as the Senior Evangelist for Lamb & Lion Ministries. He is a native Texan who resides in a suburb of Dallas. He is married and is the father of two daughters. His wife, Ann, is a first grade teacher. They have four grandchildren. Dave  as he prefers to be called  was the founder of Lamb & lion Ministries in 1980. Before entering the ministry he had an extensive career in higher education which included the following positions: Assistant to the President of Austin College in Sherman, Texas; President of South Texas Jr. College in Houston; Director of Pepperdine University's Center for International Business in Los Angeles; and Vice President of Phillips University in Enid, Oklahoma. He is the author of many religious essays which have been published in a wide variety of journals and magazines. He has written five books  Trusting God, The Christ in Prophecy Study Guide, What the Bible Says about AIDS, The Master Plan, and Jesus is Coming Soon! (a book for children). He has co-authored another book called The Parched Soul of America. His sermons on cassette tape and video tape have been distributed world wide. His books have been translated into several languages. He has led more than twenty pilgrimages to Israel that focus on the prophetic significance of the sites visited. He has also conducted prophecy conferences in Russia, Poland, Hungary, Austria, Beloruss, Israel, and South Africa. Dave is one of the spokesman on Lamb & Lion's daily radio program called "Christ in Prophecy." 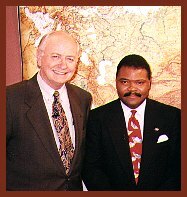 This program is broadcast across the United States. The program deals with the prophetic significance of national and international events.